Directed by Anurag Singh, Kesari is running in theaters for weeks now and its pace is still good. The word of mouth, too, was totally in the favour of the film, that immensely helped its performance at the box-office. In multiplexes, it still has enough hold over the audience and heading unaffectedly to achieve more height. Starring Akshay Kumar and Parineeti Chopra in lead roles, Kesari has received very positive reviews from the critics and also got succeed to entertain all the viewers in theaters. As a result, it gained a solid word of mouth and still showing a very good hold over the audience across India. After a good start, Dharma Movies and Cape of Good Films’ presentation remained strong throughout and did the business of 105.86 crores in the 8-days extended opening week. In the second week as well, the movie maintained a solid pace and registered the business of 29.66 crores. 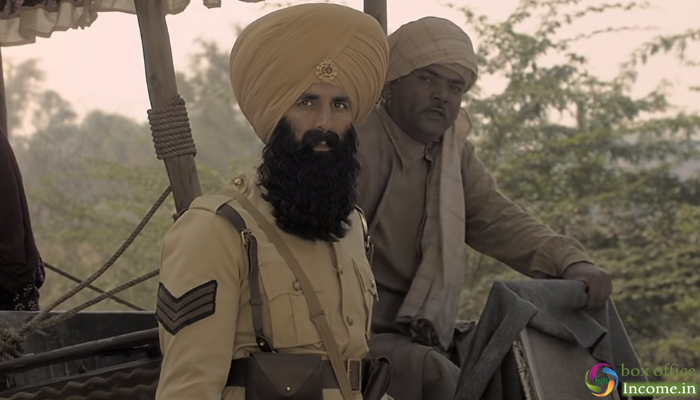 Then in the third week, after a lower-than-usual drop in footfalls, Kesari managed to collect the amount of 11.69 crores and raised its 3 weeks total collection to 147.21 crores nett at the domestic box office. Now the movie is running in its fourth week and impressively passed the weekend on a strong note. On 4th Friday, it got a slight drop than the previous day and did the business of 0.70 crores. After a usual jump, Kesari raked 1.30 crores on 4th Saturday & 1.70 crores on 4th Sunday. After 25 days of release, the total collection of the movie has become 150.91 crores.